Initially, many engineers, architects, contractors, and owners thought the downturn in the economy would be a short transition period with a quick rebound. Comments such as “If I can just hold on for 2009, things will be okay” were prevalent throughout the construction market. Many construction businesses had record profits from 2004 through 2008 and had resources to hold on for one treacherous year. For the foreseeable future, all experts are predicting an extremely slow rise from the bottom. FMI’s Third Quarter Put in Place Forecast is predicting the residential markets to begin improving this year and the non-building construction market to show signs of life next year. The nonresidential building market will not begin improving until 2012, and it still will not have reached 2008 levels of spending by 2014. 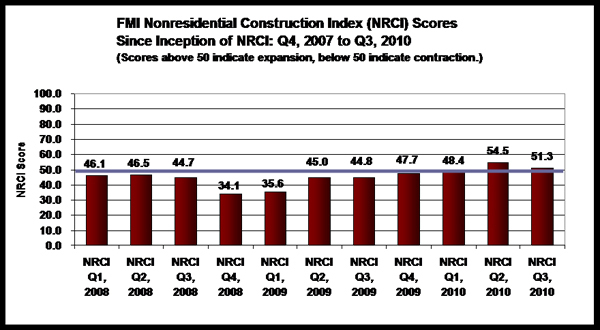 FMI’s Nonresidential Construction Index (NRCI) Report is a quarterly report outlining the opinions of construction industry executives throughout the country. The 2010 third quarter index dropped from 71.6 to 53.7, showing a lack of optimism from the panelists on their overall outlook of the economy (see Figure 2). Stimulus spending has been exhausted, and banks have not yet loosened credit. In addition, backlogs are shrinking and the cost of labor is increasing. Businesses cannot control the economy, but they can control how they approach the climate in which they find themselves. Comments from the FMI third quarter NRCI Report indicate the panelists are preparing for the economic condition called the new normal, which predicts slower growth, higher risk, and greater uncertainty. This is done by creating and implementing a strategic plan for the organization. A strategic plan is a clearly defined direction for the business for the next 3 to 5 years. The first step to creating a good strategy is understanding the context in which the organization is operating. A helpful framework for understanding this context is what FMI calls the 4-C model (see Figure 3). What is the future of the sector we serve? What are the leading indicators of economic turnaround in our geographic area? What markets are still doing well in our area? What level of talent does our organization have? Do we execute projects consistently? Did the company down the street really “buy” that project for nothing, or do they execute more efficiently? Do you know how XYZ Contracting gets in the door before you? 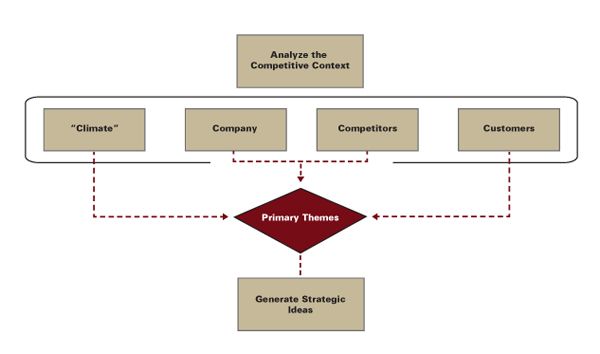 Do you understand what the competitor’s market strategy is? What is its customer strategy? Is everyone in the organization collecting competitor data as they run across it? Is it being collected in one place, or is it fragmented throughout the organization? Is there a competitor your company should emulate? What do they do that your company should adopt? Understanding what the competition does and does not do well helps an organization identify opportunities and threats. Does your organization know how the client really feels about your company? Why exactly do they use you? What do they think are your strengths and weaknesses? What do they think of your competition? What drives their buying behavior? Once a firm has a thorough understanding of the context in which it will be operating, it can craft a clearly defined direction. There are three areas to focus on: top line, middle line, and the bottom line. Top line strategies involve expanding revenue opportunities through new geographic areas, new services, and/or new customers. FMI cautions that focusing too much on top line growth without an equal focus on middle line management and bottom line growth can lead to failure. In today’s competitive environment, expected to continue for several years, focusing on the middle line will have the biggest impact on the organization. This is particularly true for labor- and equipment-intensive contractors with the highest risk exposure. Creating a strategy for middle line management means gaining a deeper understanding of and control over direct costs; organizational best practices for getting work, doing work, and keeping score; and improvements on evaluating self-performing versus subcontracting, productivity improvements, material procurement, equipment utilization, and planning. A focus on the middle line can make you more competitive, helping the top line, and more profitable, helping the bottom line. Where does sacrificing training now put us in 3 years? What will happen to our best project managers if we continue to pile more and more work on them? In strategic planning, it is important to understand both the direction the organization is heading and how decisions affect this long-term direction. Successful contractors are using the downturn to refocus and redirect the business and to upgrade talent. Well-run companies trend independently of the economy, and there are still firms making money. These organizations have a thorough understanding of the context and shift their strategy to match this context. Creating a strategic plan can help your organization be successful now and prepare it for the future.